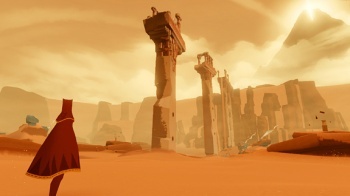 Journey: Collector's Edition's includes a ton of bonus content. The title Journey: Collector's Edition is somewhat misleading, the $30 disc-based re-release actually comes with all three of Thatgamecompany's PSN games - Flow, Flower and Journey - as well as a glut of extra content. It's scheduled for release on August 28th in North America - "info for additional territories to be announced soon" - and will come with a fancy reversible cover. The standout inclusion in the package are a trio of mini-games, delightfully titled Gravediggers, Nostril Shot and Duke War!! - all of which were made in less than 24 hours as part of the company's traditional "Game Jam." This will be the first time the games are made available outside of TGC's headquarters.